Captain Christopher Lowder (left) presents Officer Jason Zimmerman (right) with the life-saving medal award. Not pictured: Corporal Josh Best. 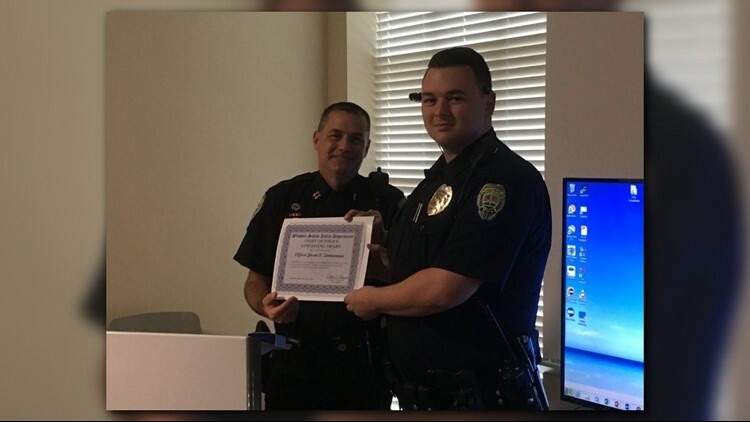 Officer Jason Zimmerman was just awarded the department's Life Saving Award after he and another officer helped save a choking toddler back in June. WINSTON-SALEM, N.C. -- Two Winston-Salem police officers are forever a little girl's heroes. Officer Jason Zimmerman and Corporal Josh Best were just awarded the department's Life Saving Award after they helped save a choking toddler back in June. The officers gave the little girl chest compressions and monitored her breathing and pulse until EMS arrived. The child was taken to Brenner's Children's Hospital after the ordeal and is okay. The person who nominated the officers for the award says their quick actions that day played a critical role in saving the child's life.